A convenient alternative way to meet our weekly requirements of healthy essential fatty acids. and positive mood and outlook. Ultramarine Omega-3 provides EFAs which are also beneficial for pregnant and lactating women since they greatly benefit the neural and visual development of the infant. There is absolutely no other Omega-3/DHA/EPA Virgin Salmon Oil product on the market that matches the ultra purity and potency of this unique and freshly produced Norwegian product—the one-and-only Ultramarine Omega-3 Virgin Salmon Oil. This superior all-natural virgin salmon oil is minimally processed to ensure that all of its natural trace elements are maintained. Ultramarine Omega-3 has not been chemically modified, so it supplies the omega-3 fatty acids the way nature provides them. Ultramarine Omega-3 brings you one step closer to nature. Our access to fresh salmon that is quickly rendered enables us to offer a "virgin" quality salmon oil that has not been exposed to high heat, bleaching, deodorizing or distillation. These processes strip the natural oil of enzymes, trace elements and natural antioxidants. 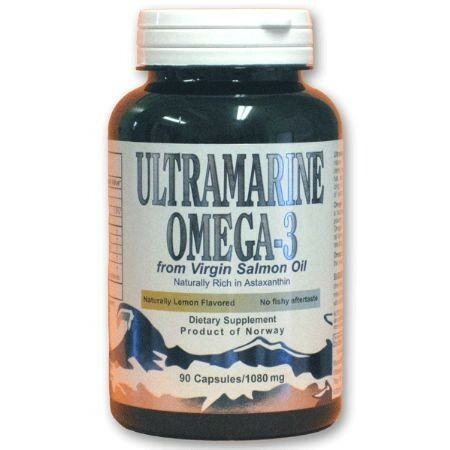 Ultramarine Omega-3 is minimally processed, containing astaxanthin, a naturally occurring carotenoid found in salmon. It is this powerful antioxidant that gives the oil its "salmon" color. Ultramarine Omega-3 has been enhanced through the addition of a natural lemon flavor and a proprietary natural antioxidant blend, resulting in a pleasant tasting product with improved stability. Contrary to popular myth, our bodies need fat; however, it must be the right kind of fat. The fatty acids that are required for good health and that cannot be made by our bodies are called essential fatty acids (EFAs). EFAs are needed by every living cell in our body. They are essential for rebuilding and producing new cells. One category of EFAs is omega-3. An excellent source of omega-3 EFAs is fish, especially salmon. Fish oil revs up antioxidant activity, which perhaps explains why many fish eaters may live longer. Unfortunately, most of us are unable to eat fish two to three times per week to meet our weekly requirements of healthy essential fatty acids. Now we have a convenient alternative way to meet our weekly requirements of healthy essential fatty acids: Introducing Ultramarine Omega-3 Gelcaps (from Virgin Salmon Oil)—a product which promises many health benefits for us and for the ones we love. Ultramarine Omega-3 is 100% pure, with no artificial coloring, additives or preservatives.